William vs. Harry, who is the real prince charming? 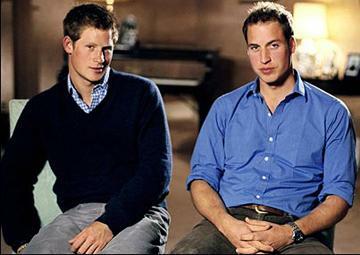 Princes Harry and William have gained much popularity in recent years. When it comes to royal masculinity, there are two princes who continue to sweep the world off their feet. Prince William, Duke of Cambridge, and Prince Harry of Wales are two royals who have recently gained major popularity. While just the sight of these men is enough to make Cinderella go back and lose not one, but two shoes, many people are unaware of what these guys actually do (other than just sit around and steal the hearts of millions of girls). Both are involved in the military, contribute to many charities, are complete hotties, and are a major part of world history. So which guy is the real prince charming? Some girls are all about Prince William, the older of the two, and newly made Duke of Cambridge. William is a geography major, who after gaining some real world experience, joined the army in 2006 as a second lieutenant. He also has experience as a search and rescue pilot with the Royal Air Force. William is involved in several charities, such as the establishment of a cancer house, and is a patron of Centre Point, a major homeless organization. He is also actively involved in the Tusk Trust organization, which helps promote relations with Africa. These are just to name a few, as he is involved with many other charities with his brother Harry. As for his physicality, William lacks behind in comparison to Harry. While many admire the slimmer athletic build, the only thing that he really has going for him is that dashing smile. His nose is rather large, but never held up too high, as you can see with his laid back way of dressing, frequently in khakis and polos. He may have a beaming personality, but that’s more than one can say for his hair. I guess the stress of royalling around has affected his hair growth, as it has started to recede. Despite all this, I doubt you’d be able to find anything more attractive in a military uniform. Some girls may prefer the prim and proper William, but even more go crazy over the younger, party boy Harry. Harry’s military activity is slightly more extensive than his brothers. He entered the Royal Military Academy in 2005 and after a 44 week course and became a second lieutenant in the Household Calvary. In 2008 Harry was involved in the war in Afghanistan, where he fought for NATO forces, and was promoted to lieutenant. Harry is still actively involved in the military. Prince Harry is a global activist as well as a military guru. With the help of his brother, there is an organization set up called “The Foundation of Prince William and Prince Harry” which helps disadvantaged youth. He also helps out with groups who are active in helping military families by means of supportive welfare and guidance. It’s not hard to see why this prince is the school girl crush of many young women. He has cool red hair, gives off a party boy vibe, has sculpted arms and cute freckles which all adding to his appeal. With his athletic body and tantalizing eyes, this heartthrob has many girls willing to be locked in a tower just so he could come save them. While his brother may have the perfect smile, Harry has inherited those European teeth. But this Brit makes having bad teeth look oh-so-good…Show me your teeth Prince Harry! So who’s the real Prince Charming? Hands down it’s Harry. This Prince is too cute and too cool, and would make it totally worth turning into a damsel in distress.